Widras is a brand dedicated to design and manufacture of premium quality bike accessories. Our new product is the bike cover: - GREAT DESIGN & AMAZING QUALITY We invested time and resources to develop the best quality and durability of our bike cover. 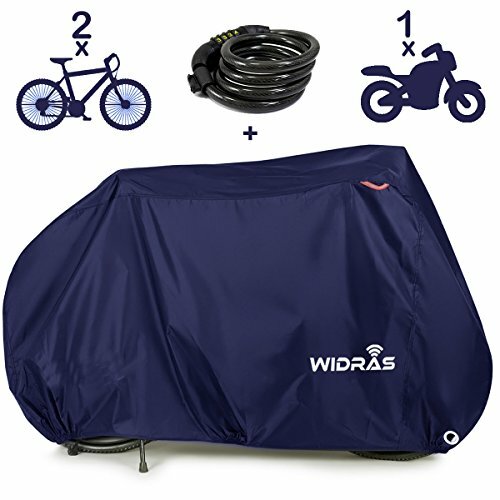 Whether you live in Florida or Alaska, our bike cover will protect your bike from all weather conditions. - PROTECT YOUR RIDE WITH THE BEST! 420D Nylon Fabric with PU coating - lifetime durability Waterproof & anti UV - stay protected against all weather Seam heat sealed & double stitching - NO leaks!  HIGH-PERFORMANCE PROTECTION - Very strong and durable Fabric with 'double stitching' & 'heat sealed' seams delivering Top-Class protection from adverse weather conditions - whether rain, snow, ice, wind, dust or sun!  LARGE SIZE - Generous large size 79 L x 43 H x 25.5 W inches (200 x 110 x 70 cm), great for a mountain, road, hybrid, cruiser and electric bikes, motorcycle. NOTE: Please measure bike or motorcycle prior to purchase to ensure correct sizing and avoid disappointment!  PREMIUM QUALITY - We're so confident about the quality of our products that if you have any product issues, we're very happy to either provide a Refund or a Replacement. If you have any questions about this product by Widras, contact us by completing and submitting the form below. If you are looking for a specif part number, please include it with your message.